Cyrus II (c. 590-.529 BCE) of Persia in c. 539 BCE conquered Palestine, Phoenicia and Syria. Cyrus II allowed Jewish exiles in Babylonia return to Jerusalem. 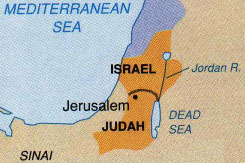 He also decreed in c. 538 BCE to rebuild first temple of Jerusalem. The following list is the Kings of Persia who ruled Judaea till Alexander III defeated Darius III in 330 BCE. Coins issued by the Persian Kings might have circulated in Judaea. The two coins below are coins issued by Persian Kings. Silver 1/6 Siglos. c.450-330 BCE. Obverse : Persian king kneeling drawing a bow. Obverse : Persian king running holding a bow and a spear.